The Voter Services committee meets on the first Friday of each month at noon at the YWCA. Their next meeting is Friday, April 5, 2019. The final tally for voter registrations drives this fall is as follows: Voter Registrations 94, Absentee Ballot Applications 70, check registrations 73, address changes 22 and name change 1. We held 11 drives total. In August at USI the Voter Services team registered 55 voters, and helped with 33 applications for absentee ballots. At U of E 4 students registered to vote, 16 completed applications for absentee ballots, and 3 people checked their registrations. At Ivy Tech in early September they registered 2 voters, confirmed 15 registrations, changed 2 addresses, and gave out absentee ballot information. On Saturday, September 15 team members went door to door with the NAACP to register voters. The League also registered voters at the West Franklin Street Bazaar that day. The committee got in contact with the Evansville Housing Authority and began by registering voters at two sites -- Buckner Towers on Monday, September 17 and and Caldwell Homes on September 18. Voter information postcards and brochures on how to get a state ID were distributed to all of the libraries. Postcards were also distributed at the food pantries at Simpson United Methodist Church, St. Vincent de Paul and Annunciation Church, as well as at Patchwork Central and additional locations. All of the Be a Voter poster contest entries were displayed at Central Library starting September 23. The League had a voter registration table at the official opening of the exhibit on September 25, which was National Voter Registration Day. 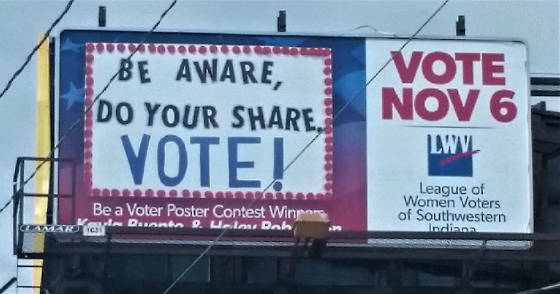 The two Be A Voter billboards were up in October at Read and the Lloyd and at 41 and St. George Rd. 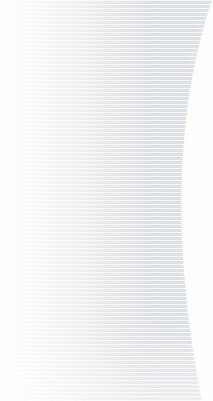 The total number of estimated views for the month was about 100,000. In the spring of 2018 LWVSWIN Voter Services team members educated seniors at all the Vanderburgh and Warrick high schools about voting. 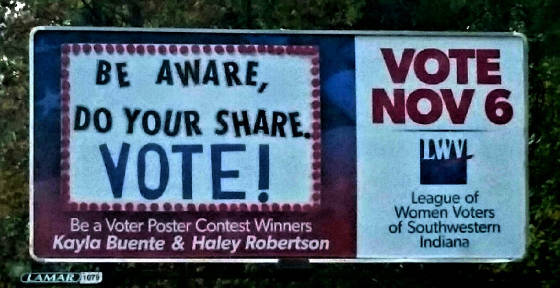 The students were encouraged to participate in a poster and video contest urging others to vote. 2nd place video winners Noah Reich and Amber Brinton on WEHT Local Lifestyles on August 9.